Just saw a great documentary called “Stripped,” an overview of the history and legacy of newspaper comic strips, as told by some of their foremost cartoonists. Among them is Bill Watterson, the notoriously reclusive creator of “Calvin and Hobbes.” When I saw that today’s @Sketch_Dailies prompt was #invisibleman, I immediately thought of him. Incidentally, I thought “Stripped” was shot and edited well, with a lot of attention to detail and some slick and clever visuals to supplement the invaluable commentary. That’s why I was surprised that the interview audio had such comparatively low production value. Maybe I’m biased because I work in television, but most of the subjects sound as if they were recorded with the microphone built into the camera; hollow and echoey. I understand that it was a grassroots, Kickstarter-funded project, but an entry-level lapel mic or boom mic would have gone a long way toward rounding out an otherwise polished film. 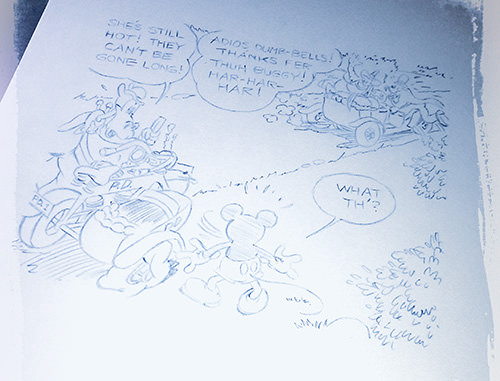 And for my final shameless tracing, here’s a panel from a series of strips in which Mickey attempts various methods of suicide. (Spoiler alert: he doesn’t succeed.) This time I went with warm, comfortable digital inking. My mom asked if I was getting arthritis from drawing too much; actually, I think what’s happened is I’ve come to rely on my graphics tablet so much that I haven’t developed a lot of manual dexterity. 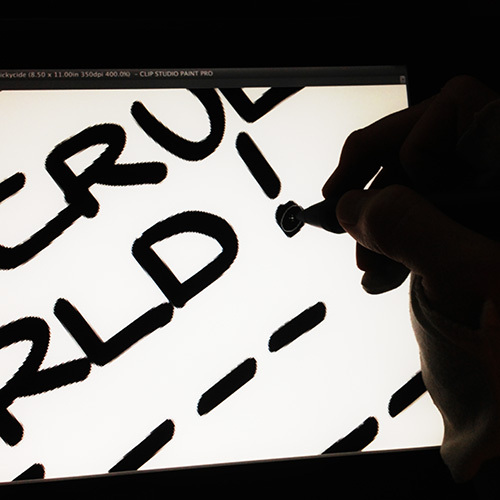 With digital, I can zoom in to my heart’s content and use my whole arm to draw tiny details or letters. On paper, even if I’m drawing on a large scale, there are bound to be some details that require fine movement of the wrist and fingers. One thing I discovered when taking my oil painting class is that I’m actually capable of some fine motor skills, but, in a way that’s kind of hard to explain, I have to get in sync with my breathing. There’s a certain pace at which my trademark wobble disappears, and I can hold a brush by its back end and paint an eyelash in the spot I intended. I think there are a couple of factors at play. One, I tend to rush. Second, I pace myself better when I’m standing. I think tomorrow I’ll try a round of conventional inking while standing, and see if I can’t recapture some of that magic. Another attempt…think I’m getting worse! Actually, Mickey’s not so bad, but my hand cramped up by the time I mangled his telephone and tried to letter with a brush pen. Ouch. I’m such an awesome Disney employee, I go back and re-do work dating back to the 1930s! Actually, I was thumbing through the copy of the Smithsonian Collection of Newspaper Comics and marveling at the level of detail Mickey Mouse cartoonist Floyd Gottfredson was able to cram into panels printed less than 2 inches high. I did a little research and found some originals for sale, their descriptions indicating that he drew these panels at a whopping 5 3/4″ tall! So, I printed the panel at what was probably the original size, traced it in blue pencil using my light panel, then inked it with several of my Zebra and Pitt disposable pens. I added the halftone digitally in Manga Studio. No, it’s not creative to trace other people’s work, but it can be good practice. Reduction helps my inking a whole lot, which is kind of the idea, but even full-size comic inking has a sort of confidence that I’ll only be able to match with lots of practice. In its 3rd week, my graphic novel class has evolved into something less structured, where we students work on brainstorming one-on-one with the teacher as we try to figure out what our comic is going to be about. Today, the teacher said something interesting directly to me: “there’s nothing I can teach you about making comics, you already know everything.” By that she meant, I already know most of the rules and language of comics, and the technical intricacies. What I’m really going to get out of the class is feedback about story ideas, and the opportunity to create something outside of my comfort level. She likes Kerkel, but feels the characters lack depth. She also thinks the cartoony style of Kerkel is very “safe,” and that I should consider making a comic using a looser style, such as the one I used in this caricature of Rochester. And she thinks I should draw more people frowning! Hence Mary Rae drowning her sorrows after Kerkel is kidnapped (a storyline I’m considering). I don’t know that I’m going to use all of her ideas, but I appreciate the basic thrust of her argument: I need to flex my storytelling muscles, and experiment with different styles of art. If I ever do this professionally I may be able to fall back on my Looney Tunes style of art and gags, but now’s a great time to branch out a little, and see if I can create some art that people will connect with. I’d like to have a solid idea or two by next Thursday, so let me know if you have any suggestions! This is make-up homework for a class I missed last week. 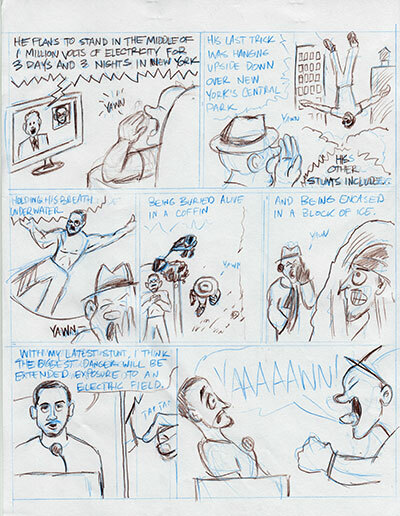 The assignment was to choose a short news article about something you dislike, and make a one-page comic about it. I inked it digitally, but locked in most of the drawing on paper first.